When your kid needs a special diet the last thing you want to do is spend every mealtime enforcing it. Making feeding the kids into a constant power struggle is a recipe for wasted food, cranky kids, miserable parents, and future eating disorders. Even if you manage to enforce a diet on your child, the minute they are out of sight you may find they “cheat.” In the long term, tight control over your child’s diet is not going to work. So what do you do instead? Bonus: It also helps if they like the food! Give these things to your children (and yourself while you’re at it), and you’ll have a much happier family life and a much healthier relationship to food! So… how do you do it? We’ll lay out the steps in this series! Before we get started, though, I’d like to elaborate a bit on the reasons one may or may not decide to put their kid on a special diet. In general, I think dieting as it is typically undertaken in our culture is a bad, bad idea, especially where kids are concerned. If you are putting your children on a diet to get them to lose weight STOP RIGHT NOW! It’s been shown time and again that dieting for weight loss, especially as a child, is a good way to create low self-esteem, eating disorders, and a dangerous long term pattern of weight cycling. If you are concerned about your child’s amount of fat, you may want to look into potential underlying health issues. Just remember – your child’s size is not the problem, and not the focus. When seeing health care professionals, protect your child from their fat-shaming ways! Food allergies, intolerances, or other digestive problems (even celiac disease). Growth Hormone Deficiency – these children will stay short but sometimes put on weight anyway. Prader-Willi Syndrome – this very rare condition makes people ravenously hungry. Cushing’s Syndrome – elevated cortisol levels lead to weight gain. Some kids are very small for their age and don’t gain weight. I’ve seen doctors prescribe “whatever you can get in the kid” diets to picky eaters, without even checking for potential root causes of their size. They call it “Failure to Thrive” – a meaningless diagnosis, since it only describes the child’s growth pattern, not the cause! Celiac Disease – the villi in the small intestine become damaged, leading to malnutrition. Hyperthyroidism – the child will often have a strong appetite if this is the cause. Infection – when fighting off an infection a person may lose their appetite and lose weight. Diarrhea or Vomiting – these can be caused by infections, food poisoning, food intolerances, allergies, celiac disease, Crohn’s disease, ulcers, or other digestive problems. Turner’s Syndrome – a chromosomal abnormality in some girls which causes short stature among other things. Kidney Disease – nutritional deficiencies and hormonal imbalances can be caused by kidney disease. Growth Hormone Deficiency – causes shorter stature, often with increased weight for height. Sores in the Mouth – canker sores can make it painful to eat. These can be caused by allergies or celiac disease. Any other sore in the mouth or esophagus could have the same effect. Sensory Integration Issues – if overwhelmed by flavors, smells, or textures, sensory integration issues may be preventing your child from eating. An Eating Disorder – it is possible your child has an eating disorder such as anorexia or bulemia which causes them to restrict calories, purge them, or exercise excessively. It’s important not to jump to the conclusion that a child who doesn’t like to eat is anorexic. There is often a physical cause! The underlying cause of small size can dramatically change whether dietary intervention is warranted, and what that intervention should be! As when adjusting diet and exercise for fat kids, tiny kids need the focus to be on their health rather than their size. IgE allergies are also known as “true allergies.” The most severe can cause anaphylactic reactions to the slighted exposure. This is the sometimes fatal type of reaction people have come to associate with peanut allergies. IgE allergies can also show up as sinus pain, a runny nose, itchy eyes, eczema, hives, swelling, and more. Some people find that they can have a small amount of the food they are allergic to without a problem, but more will set them off. Most people with IgE allergies find that when their system is more overloaded, their reactions are more extreme. For example, our son has an IgE reaction to corn. He also has “hay fever” – he used to test positive for all weeds, all grass, all trees, dust, mold, and more. When pollen counts are high, he is more sensitive to corn. When he’s been eating corn, he’s more sensitive to pollen! By taking corn out of his diet, we were able to dramatically reduce his reactions to environmental allergens. The more severe your child’s IgE food reaction is, the more important it is to make a rigid dietary change. Food intolerances can cause symptoms like vomiting, constipation, or diarrhea, or cause kids to be tiny or huge for their age. They can cause ADD/ADHD, dyslexia, and mood swings. Some people notice no symptoms at all. Testing for food intolerances (typically IgG reactions on an ELISA test) is controversial. The tests are not extremely sensitive and accurate. A positive result doesn’t necessarily show an innate intolerance to a particular food. Rather, it shows that the gut is damaged and partially digested food is making it out into the blood stream. The body then attacks those proteins, creating the IgG antibodies. For this reason people show higher reactions to the foods they recently ate. So if you have test results that show food intolerances, or suspect a food, the way to test whether it is a problem is to cut all suspected foods from the diet for a couple weeks until symptoms are dramatically reduced then reintroduce them one by one, every few days. It’s important to space out introductions of new or suspected foods because reactions are not always immediate. The typical recommendation for people who show IgG reactions is to go on a rotation diet. In these diets, you only eat small amounts of the foods that you showed moderate reactions to, and then you don’t eat that food again for several days. This allows the inflammatory response to that food to die down before you introduce it again. Another approach is to go on a diet such as GAPS to heal the “leaky gut” and resolve as many food intolerances as possible. Doing these kinds of diets for your children requires good communication and teamwork. You will be relying on your child to tell you or show you their symptoms, and to stick to the diet so that you can get good information about what is or isn’t causing reactions! There are two kinds of diabetes, and while both can be helped by dietary changes, their requirements are different. There is no dietary solution for Diabetes Type 1. Type 1 Diabetes (formerly known as juvenile diabetes), is believed to be an autoimmune disorder in which the insulin-producing cells of the pancreas are destroyed attacked and so can’t produce insulin. Without these cells, the body can not produce the insulin necessary to metabolize food. That results in high blood sugar. To control diabetes type 1, your child needs to eat regularly with a consistent balance of carbs, protein, and fat. Keeping good records is also important. edit to add: Choosing a diet that includes regular eating times and a consistent balance of carbs, protein, and fat, and keeping a food journal may help them avoid extreme swings in blood sugar; however, this will not change the fact that they will still need to monitor blood sugar and take insulin. Blood sugar is also affected by stress, activity levels, and more. Your child also may be able to learn to recognize the feeling of high and low blood sugar to help with monitoring. Children with Type 1 Diabetes should be told that there is nothing they did to cause their disease. A good diet is not a cure for Type 1 Diabetes. Until a cure is found, they will need to use insulin, no matter what foods they eat. In Type 2 Diabetes there is plenty of insulin, but the body doesn’t respond to it properly. Supplements or medications may be prescribed, and blood sugar will need to be monitored throughout the day. As with type 1 diabetes, good records of diet need to be kept, and your child will need to eat regularly with a consistent balance of carbs, protein, and fat. As with diabetes type 1, blood sugar highs and lows need to be recognized and treated to prevent serious problems. “Cheating” on a diet as a diabetic can be very dangerous. Getting fingers stuck several times a day and getting injections of insulin isn’t fun. Kids with diabetes need to understand as much as possible about their condition in order to be able to cope with these realities of treatment. ADD/ADHD, Mood Disorders, Autism, Learning Disabilities, etc. Feingold – This diet eliminates exposure to synthetic food additives and reduces salicylates. Gluten-Free/Casein-Free – Gluten and casein can break down and cross the gut lining as opioids which interfere with brain function. This diet removes gluten and casein to prevent that from happening. GAPS (Gut and Psychology Syndrome) and SCD (Specific Carbohydrate Diet)– These diets have the aim of healing a leaky gut and restoring the balance of flora in the gut so that partially digested food molecules and toxins no longer cross into the blood stream and nutrients are better absorbed. Unlike Feingold and the GF/CF diet, these diets do not include any processed foods and only allow certain forms of sugar. They are similar to the Paleo way of eating. Unlike with diabetes, where response to diet and insulin is well documented and easy to track, or a food allergy with obvious and immediate symptoms, dietary changes for these kinds of disorders can be harder to evaluate. 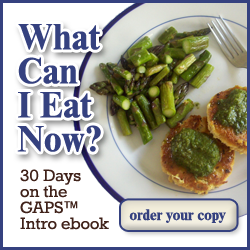 We had amazing success with the GAPS diet – but it took time. Having the children’s cooperation and commitment to a diet like this is critical to its long term success. If there are no known health issues and you simply want your family to eat real, whole, organic food, we heartily approve! But these are also the kinds of diets that get a bad rap. You’ve no doubt heard adults talking about how their mom made them eat health food and now all they eat is candy and frozen dinners. That’s definitely not the end result you want! Next step – get a fresh start and have a transformative conversation with your kids! What are your reasons for wanting to start your children on a special diet? This post is part of Fat Tuesday, Tip Me Tuesday, Hearth and Soul, Traditional Tuesdays, Teach Me Tuesday, and Healthy 2day Wednesdays, and Frugal Days, Sustainable Ways, Fresh Bites Friday, Allergy Free Wednesdays. We used a process of elimination and challenge to determine the cause of our children’s odd behavior (what looked like neurological issues) and “failure to thrive.” We have since come up with more meaningful diagnosis of SPD with Wheat and Dairy intolerance. We have spent the last 2-3 years eliminating the problem foods, healing the gut with probiotics and enzymes, and are happy to say they are gaining weight and able to eat all the wheat and dairy that we want them to (still no white flour or uncultured milk)! Elimination and challenge is a great way to go, especially when it turns out just one or two things are at play and damage is not too far gone. It’s very important to get to the root cause of physical symptoms – there can be so many different possibilities! I tried elimination and response as well as Feingold with our son, Kid2, when he was much younger. Unfortunately I was unable to figure out the root cause of his issues that way. In retrospect, I now see that he was so inflamed that he was reacting to some foods that weren’t the cause of his problem, and eliminating other foods that were the cause didn’t show a good result because I either didn’t eliminate them completely enough (gluten) or other reactions kept going even when I removed another of his problem foods. I’m glad to hear that your children’s behavior and growth differences have been figured out and that they are doing so well! Thank you for writing such a great post! My son has Asperger’s Syndrome and sensory processing disorder. Food has made a world of difference for him, we are currently (sort of) implementing GAPS diet. He is 13 and its HIS choice to eat this way and 99% of the time he chooses to!! We are still working on that 1% but he is realizing how good he feels so he is very willing! I am amazed every single day at his progress and healing! You can read more about it on my blog- there is just way too much to summarize here. http://www.ournourishingjourney.com Thanks again!! And good food DOES heal! I’ve come across your site before for your awesome ferments 🙂 but had never read Blake’s Story or yours before. Thank you for sharing your personal experiences! I too have struggled with mood, among other things, and am finding that diet (as well as Cognitive Behaviour Therapy tricks) have made a huge difference. The fact that experimenting with cocktails of medication seems to be the first intervention for these kinds of issues is astounding to me. While medications certainly have their place, we need to raise awareness among medical professionals that there is another way, which is much safer, to explore first!!! Thanks for linking your great post to FAT TUESDAY. This was very interesting and comprehensive! Hope to see you next week! Thanks for sharing. We have never had issues with our kids being overweight. But dietary restrictions have always been part of the landscape over the last 4 years. I have been very careful about how I present food, talk about which ones are harmful and which are helpful, and deal with cheating. Like you said, it is counterproductive for the parent to punish kids for cheating or for behaving like the food police and restricting access. I have one child who sticks to his diet 100% and does not have any symptoms at all and hasn’t for over 2 1/2 years. My middle child has no issues digestively so he eats healthy at home and when out snacks on typical food without issue. My youngest will hoard and hide and is symptomatic. So to deal with this problem I just let him O.D. on the bad stuff and get very symptomatic. I did not punish or restrict him. I let him experiment and then we talked about his symptoms and the possible culprits. (He has tics when he consumes yeasty foods and artificial stuff– at home he is GFCF and all natural). After his Halloween candy free for all his tics got really annoying for him and now he is monitoring his diet himself pretty well for a 5 1/2 year old. So I think sometimes letting go of the reigns works just fine as long as you educate and empower your child to make the right decisions when they are ready. It was hard to see him make these poor decisions and suffer, but I feel like the hoarding and hiding and power struggle is finally past us. It sounds like you are doing a great job. Isn’t it interesting how each child is different? That is one of the blessings of having more than one – you know that (both for better and for worse) it’s not all about your parenting! My family do not have any food allergies, but I found this post very interesting nonetheless. It was really well written and comprehensive! Thank you for sharing it with the Hearth and Soul hop. Our boys both showed signs of pyroluria and were found to be deficient in zinc, B6, and magnesium regardless of diet. So supplementing is important, especially when stress levels are up. My oldest will become light sensitive when his zinc stores are down. I don’t supplement daily for him anymore. Maybe I should, but as long as he is well I don’t want to overdose him on the zinc. When he was first dxd he needed 50mg a day! But too much zinc is dangerous. Magnesium is important for reducing tics, too. It is a natural muscle relaxer. I bought a spray bottle of topical mag and I put it on my little guy’s neck when he flares up. He has a neck tic when he ‘cheats’. I am lucky that the guys weren’t dxd with Tourette Syndrome. For us it is mild. Was your daughter fully vaxed? I read about vaccines also causing tics. My little guy was vaxed for preschool and developed tics 5 days later. He was already on a Gluten free and Corn free diet with low sugar because of his older brother. We did the Doug Kaufman diet (a little different than GAPS) and heavy meds for systemic fungal infection coupled with HIGH probiotics (30 bill through Kirkman Labs). His symptoms resolved in 2 1/2 months. BUT, he fell off the food bandwagon and they slowly crept back after Halloween. He doesn’t do dairy. We learned that over the last 9 months. Does your daughter get red, hot ears? He used to get that but after symptoms went away from the anti fungal meds he hasn’t had that since. Our story is here: All kids are different. So it is hard to say what triggers what. Thanks for your reply, Caryn. We do supplement with ConcenTrace Mineral Drops which have magnesium and zinc (as well as fermented cod liver oil/butter oil), but we’re not very consistent about the mineral drops. I tried to get Kid1 tested for deficiencies but our doctor at the time wouldn’t order it. She goes to the endocrinologist this week for her 1 year follow up for follow up testing and we’re going to have a lot of blood work done and hopefully will be able to get more information this time. (She’s also extremely small for her age.) I’ll make sure these things get checked for! As for vaccinations, she had a selective few as a baby when I thought I’d have to put her in day care. Then she didn’t have any until we traveled internationally a few years ago. Her tics have ranged from mild to constant from the time she was at 2 years old (or younger – I just didn’t recognize them as tics back then). She got a diagnosis at age 9. But honestly, all a diagnosis does is say, yes, these are tics. That was useful for us in explaining what was going on to other people, and in teaching us to accept her tics rather than assume she was misbehaving. She doesn’t get the red hot ears that I’ve noticed, but Kid2 has had those with his allergies. She does eat a lot of probiotic foods, but we haven’t been giving her therepeutic probiotics. That might be something to try. I’m currently plowing through the book Natural Treatments for Tics and Tourette’s and the big takeaway so far is that even if she doesn’t have other typical symptoms of allergies, *this* could be her main symptom of allergies. Thanks for linking up to Healthy 2Day Wednesday! I found the section about IgG allergies particularly interesting, because those always confused me – now I understand! Thanks for the in-depth explanation. Thanks for featuring us, Jill! Wow! You have a wealth of information here. Thank you for sharing it Allergy-Free Wednesdays! Happy Anniversary Real Food Forager! Type 1 Diabetes (formerly known as juvenile diabetes) is an autoimmune disease that occurs when the body’s own immune system destroys the insulin-producing cells of the pancreas (called beta cells). Type 1 diabetes has no cure and cannot be “controlled” through diet. Until there is a cure, people with Type 1 Diabetes will always need to monitor their blood sugar and inject themselves with insulin in order to live. Although some people are able to feel high and low blood sugar, this is not something that can be taught and each person is different. Children with Type 1 Diabetes should be told that there is nothing they did to cause their disease. While eating and healthy and exercising is good for everyone, for Type 1 Diabetics it will not change the fact that they will be insulin-dependent for the rest of their lives. I’m sorry for the delay in approving this comment. I just didn’t see it until now! Thank you for taking the time to write this. I am not currently looking at my old post so I’m not sure what exactly you were reacting to, but everything you say here looks right on to me. I’ll try to get in to the the post itself and make any necessary corrections soon. Apologies for any misinformation I may have spread.